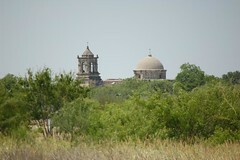 Yesterday I traveled from Laredo up to the San Antonio Missions. I tracked the Mier y Teran Border Commission’s progress pretty well, but was unable to locate Cañada Verde. It’s there, I’m sure, but more than likely on private property. After this they stopped on the Frio River and then went on to San Miguel Creek for another night. Both the Frio and San Miguel were permanent waterways in 1828 and both are bone dry now, a combination of drought and the depleting our or aquifers. Except for one stretch along Interstate 35 from Laredo up to Dilley, I took all local roads. Along the way I found two Old King’s Highway markers placed there in 1918 by the Daughters of the American Revolution. One was in La Salle county near Fowlerton and the other was in Bexar County near the Medina River. These old granite markers are fascinating. They certainly came from a quarry like this in the Hill Country near Lake Buchanan. I’m trying to stay off the big highways. One thing that struck me as very obvious is that the Brush Country was not always like it is now. Climate change may be altering Texas now, as heretofore perennial creeks like San Miguel are bone dry, but before climate change came man with his suite of animals that altered the landscape. Charles Mann writes about this at length in 1491–that often landscapes which look wild and untouched, have been altered by humans in many ways. The Brush Country is a perfect example. Spanish explorers speak of prairies filled with luscious grass between the Rio Grande and Nueces. It was “an open country, with plains and a few dense woods.” One thing they don’t write of is large prickly pear prairies. In some areas Sanchez and Berlandier mention small stands of nopales–the Spanish word for cactus opuntia, but only in passing. One might think an impenetrable swath of cactus would raise the ire of early explorers. The assumption of most scholars is that they were not there then. These cactus are not immune to the cold, either, as a great cactus die off occurred in South Texas in the 1890s. Hundreds of miles died in a great, hard freeze one year. The cactus prairies we see now are no doubt the result of the cattle ranching. Many scholars believe this area was the birthplace of the American cattle industry as well. But it was the introduction of Spanish cattle in 1690 by Alonso de Leon that altered what was once excellent cattle country into what it is now: a seemingly inhospitable landscape of cactus, wajia brush and mesquite trees. Cattle move seeds around. Brambles attache to their legs, carrying the grasses and stickle-burs far afield. By 1828 when Jose Maria Sanchez came through he was writing of a place that was undergoing many alterations. He saw wild cattle–the Spanish ranchers just let their cattle run wild, often not even branding them. By the time of the industrial revolution 75 years later the Brush Country had become mostly what it now is. Crossing the Nueces River is to cross one of those invisible but all to real isohyetal lines. The Live Oak prairies began where before their was only mesquite. Agriculture increases, although it’s irrigated agriculture, not dry farming. Cattle ranching is still very real, it is Texas after all, but it too declines in the wake of cleared, plowed and sowed fields. Later in the day I ambled across an old cemetery where a couple of hundred rebellious subject of the Spanish Empire are buried. They fought nearby at the Battle Of Medina on August 18, 1813: the bloodiest battle in Texas history. As context, Napoleon was fighting in Europe and the United States was fighting England in the War of 1812. One place that has flummoxed me to no end is a hill in this area called San Cristobal. Sanchez and Berlandier (the French naturalist accompanying the Border Commission) both write that it was large and contained iron ore. There simply are no hills worthy of note in this area. It is flat, sandy soil with lots of rivulets, gullies and the like, but no hills. This is very, very strange. Why? Because I know this area very well. I spent a large part of my youth fishing in the Medina and San Antonio Rivers and Salado Creek and Cibilo Creek. I asked several locals about it, not one of them knew what I was talking about. I then wondered if it had been mined, or somehow worn down by man, but one would think there would be notices of it in San Antonio’s well documented history. Oh well. I then rolled into San Antonio proper and visited the four main missions in town: Espada, San Juan, San Jose and Concepcion. There is one other mission in San Antonio I didn’t visit, the Alamo, as I have been there many, many times before. But these four and the old aqueduct that is still in use, I had never visited. I spent my whole life in San Antonio and had only seen Espada once before. This entry was posted on Monday, June 6th, 2011 at 7:01 am	and is filed under Mexico, Modern America, Texas. You can follow any responses to this entry through the RSS 2.0 feed. You can leave a response, or trackback from your own site.